The Ritz-Carlton, Laguna Niguel presents a curated exhibition of marine life art by renowned artist Wyland. The exhibit, titled “Hope for the Ocean,” recognizes his foundation’s new partnership with the United Nations Environment Program in support of the UN’s 2030 Sustainable Development Goals. On display from September 1 through January 4, 2018, the exhibit is open to the public and includes 25 original oil paintings, Chinese sumi brush paintings, giclees on canvas, aluminum, watercolors, a bronze sculpture, and a mixed media coffee table. 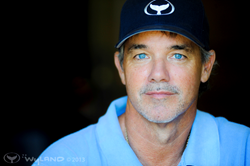 Laguna Beach-based marine life artist Wyland has built an international reputation for his commitment to marine life conservation, most notably through his monumental marine life murals, the Whaling Walls. Spanning thousands of square feet, these massive works of art expose more than one billion people each year to the thrilling diversity and beauty of life that exists below the surface of our ocean planet. This multi-faceted artist works in multiple mediums, including oils, watercolors, acrylics, Japanese ink paintings, bronze sculptures, fine art photography, and mixed media. He is considered one of the most successful working artists today, with galleries throughout the United States, and more than half a million collectors around the world. Each of his works speaks to our beautiful but fragile marine ecosystem. Dedicated to saving our water resources through art and education, his non-profit Wyland Foundation is actively engaged in alerting millions of students around the world to become caring, informed stewards of our ocean, rivers, lakes, streams, and wetlands through classroom education, community events, and public art projects. “The ocean has been a source for awe and wonder since time began; but we’ve come to a crossroads where what we do now can make all the difference for the next ten thousand years,” said Wyland. “I’ve always seen incredible beauty in the sea. I suppose that’s why I feel such a responsibility to ensure the health of this precious resource,” he added. Did you know? Our rainwater, drinking water, weather, climate, coastlines, much of our food, and even the oxygen in the air we breathe, are all ultimately provided and regulated by the sea. Each year, at least 8 million tons of plastic ends up in the ocean. Marine litter directly impacts more than 600 marine species. More than three billion people depend on marine and coastal biodiversity for their livelihoods. What WE can all do: Our impact on the ocean often begins thousands of miles upstream in our watersheds. The choices we make there can make all the difference in the world. The Ritz-Carlton, Laguna Niguel is situated atop a seaside bluff with panoramic views of the Pacific Ocean and miles of sandy beach. Presented against an extraordinary backdrop, the resort continues to redefine the guest experience by creating distinctive and unforgettable moments that instill memories that last a lifetime. Make the oceanfront resort a part of your travel plans and #DiscoverYourMoment. The resort offers many extraordinary luxury experiences including Raya, 180blũ, The Market Place, enoSTEAK, Bar Raya, The Ritz-Carlton Spa and the Eco-Adventure Center. For more information or reservations call 800-241-3333, the hotel directly at 949-240-2000, a travel professional or visit http://www.ritzcarlton.com/LagunaNiguel.